Beth Mowins and Debbie Antonelli to Headline 8th Annual "The Women's Sports Report"
Friday, Feb. 16, 2018 | Battelle Grand Ballroom | 8:00 – 9:00 a.m.
COLUMBUS (Jan. 19, 2018) - In a male-dominated sports world, women continue to break down barriers and flip the script to become leading broadcast analysts. Two of the top sportscasters in the country, Beth Mowins and Debbie Antonelli (pictured right), will headline the Greater Columbus Sports Commission’s 8th annual The Women’s Sports Report, presented by OhioHealth, on Friday, Feb. 16 at 8:00 a.m. at theGreater Columbus Convention Center. Beth Mowins made history in 2017 as the first woman to call play-by-play on ESPN&apos;s Monday Night Football, as well as for the NFL on CBS. Debbie Antonelli was the first woman in 22 years to call an NCAA men&apos;s basketball tournament game in 2017. 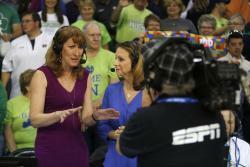 Both women have called the action during the NCAA women’s basketball tournament and most recently served as the analysts for Westwood One’s coverage of the Women’s Final Four. Mowins joined ESPN in 1994 as a play-by-play commentator. She has called NCAA Championships in basketball, softball, soccer and volleyball and has been the voice of the Women’s College World Series for over 20 years. She is a staple on ESPN’s regular-season men’s and women’s basketball schedules and began calling college football for the network in 2005. Mowins became the play-by-play voice for the Oakland Raiders preseason games in 2015, working with four-time Super Bowl champion Matt Millen. For more on Mowins, visit here. Antonelli, as a player, marketing executive and broadcaster, has been a major influencer in the women’s college basketball circles, and has served as an analyst for ESPN, including games on SEC Network and Longhorn Network. Her 29-year announcing career also includes games for CBS, Fox Sports Net, Big Ten Network, NBATV and Westwood One, in addition to being an analyst for the Indiana Fever since the WNBA started in 1997. After receiving a master’s degree in sports administration from Ohio University, Antonelli went on to be the director of marketing at University of Kentucky and Ohio State, where she got women’s basketball games aired on local television, and was also the play-by-play voice for five years. For more on Antonelli, visit here. The breakfast will also recognize the athletic accomplishments of Ohio High School Athletic Association (OHSAA) Girls State Champions in Central Ohio in 2017 with a Celebration of Champions, presented by Marathon. Attendees have the option of purchasing an individual ticket or a table of 10 to The Women&apos;s Sports Report. Attendees also can choose from VIP table/ticket options, which feature priority seating for their table. To purchase tickets or a table for the breakfast visit columbussports.org or call 614-222-6134.